Pitter pat. Pitter pat. Pitter pat. The rain fell against the windowpane, splattering the glass with large drops of water. "I want to go outside and play, Mum," Robbie whined. "When is it going to stop raining?" His mum didn’t know how to answer Robbie’s question. She wished that it would stop raining too. For three days Robbie hadn’t been able to go outside and play. "I’m sure it will stop any time now, Robbie. Why don’t you come and help me make some cookies," she suggested. Robbie was tired of making cookies. He’d made cookies every day. He didn’t want to play with his toys. He didn’t want to watch television. He wanted to go outside and play! "No, Mum. I don’t want cookies," he cried and ran into the living room. He threw himself on the couch and sighed. "I just want to go outside," he moped. His mum, seeing how sad he was, had an idea. "Robbie, why don’t you go upstairs and put your rubber boots on and your raincoat and rain hat too." Robbie sat up and smiled. "Has it stopped raining?" "No, but there is no reason you can’t go outside and play in the rain. Would you like that?" she asked. "Yes, Mum. I want to go outside and play, even in the rain," Robbie laughed. He ran to his bedroom and put on his red rubber boots. They fit snuggly over his tennis shoes and would keep the water out when he splashed in the puddles. He slipped his raincoat on. It was red too, just like his rain hat. "I’m ready, Mum," he said. "Wait one more minute," she answered. She opened up the closet and picked up a bright yellow umbrella. "Here you go. You’re all set now. Go outside and play." She hugged him and opened the front door. The rain was pouring down. Puddles were all over the grass, street and sidewalks. Robbie opened the umbrella and stood in the rain. It fell all around him, bouncing off the umbrella, his rain hat and raincoat. He started laugh and run around, splashing in the deep puddles. Water flew everywhere. "Are you glad to see the rain?" Robbie asked the flowers growing in the garden. They seemed to nod yes, answering his questions. "I’m enjoying it too," he giggled. Robbie’s mum stood at the window watching her son. He was having so much fun. She remembered when she was a little girl. She liked to splash in puddles too. Another brilliant idea came to her. "Mum!" Robbie called, as the front door opened and his mum walked out. 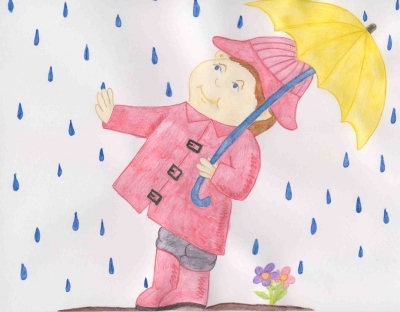 She was dressed in her yellow raincoat, wore her yellow rain hat and rubber boots. She had a blue umbrella. "Can I splash in the puddles with you?" she asked. "Yes, Mum. Come and splash. It’s fun," Robbie said. Mother and son stayed out in the rain for a long time. They jumped in the puddles and splashed on each other; they sailed leaves down the overflowing gutters; they tried to catch raindrops in their mouths and even switched umbrellas. That night, when Robbie went to bed, he thought about how glad he was for the rain and for the wonderful day he’d had outside playing with his Mum.